We had a week of uninterrupted warm summer weather with clear blue skies and almost no wind - the latter rather disturbing for Wellingtonians, accustomed as we normally are to plenty of air movement! The first day of 2016 was hot and sunny - but wet weather was coming down from the north. 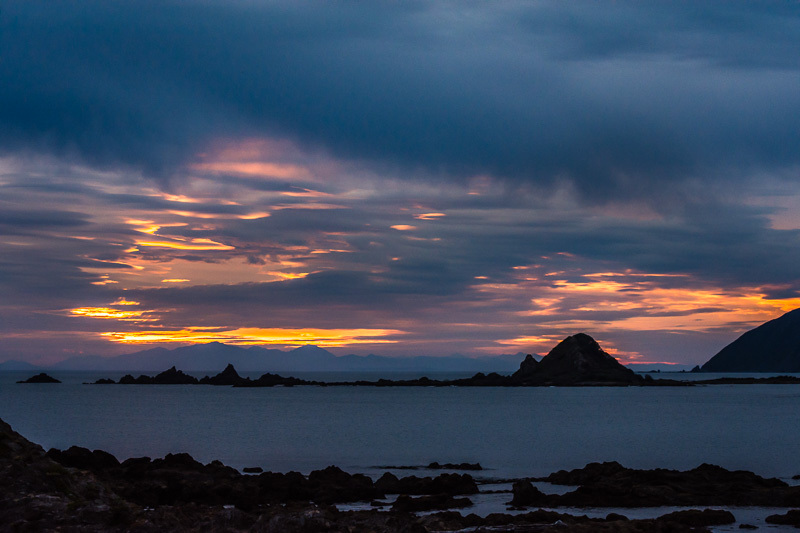 So by the time of sunset the sky over Taputeranga (the island of Island Bay), looking to the South Island in the distance, was dramatic. It reminded me somewhat of the fireworks of New Years eve. Another year has begun with all the beauty and drama of nature. And I remember why I am doing this. I see the environment as a source of endless delight as well as being the source of our sustenance, and I want to share with you my love for and interest in the world of living things. This is our world - we are part of it and we rely on it. If we care about our future, we must care for our environment - see it, appreciate it, learn about it, and work on being good guardians. We can all do this if we own our responsibility and power. In the words of one of my heroes, Wangari Maathai, (who founded the Green Belt Movement which has planted more than 10 million trees) "You cannot protect the environment unless you empower people, you inform them, and you help them understand that these resources are their own, that they must protect them."